Straight out of my collection of supercabs! 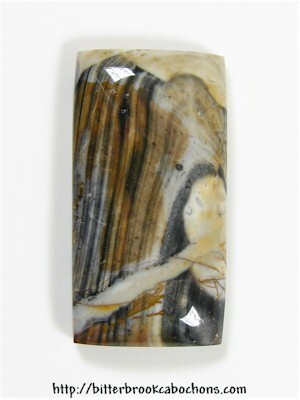 Here's a mystical mountain scene in this unusual cabochon of Ohio Flint. Or, if you've been writing descriptions of cabochons all morning, you may see a shark getting a dental exam. Whatever. Both sides of me agree, this is a very nice cabochon! 32mm x 17mm x 5.5mm. Weight: 31.10 carats. You are visitor number 148 to this page this year.